Salem is located at 751 West 350 South, unincorporated Hebron, Indiana, near the Salem United Methodist Church. The cemetery is privately owned and operated and is one of the oldest in Northwest Indiana. 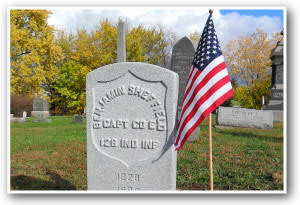 Located near the Lake/Porter County line and just south of Lakes of the Four Seasons, Salem is the burial site of many founders of Winfield Township in Lake County and rural Boone and Porter Townships in Porter County.